You can be sure that Aussies have an unhappy relationship with the US when the issue of coffee is discussed on the National News in serious tones. But while we often hear about "that disgusting muck that passes for coffee in the US", or "a pale imitation of the real thing", and sometimes, "it's even worse than used dishwater", we rarely hear about what the Yanks think about the glorious beverage we treat with deep respect. I was delighted when I attended a conference in Sydney recently, to discover that there wouldn't be urns of stale coffee waiting to be dispensed into ghastly styrene cups at break times, or even barely palatable ground and filtered coffee, which has often been sitting for hours and become bitter and decidedly unpleasant. No! The organisers clearly understood the needs of the group and had arranged for four high-tech, mobile coffee machines, staffed with keen-eyed and enthusiastic baristas, to wait on attendees. The beans were freshly roasted, then ground as needed, the milk (your choice of full cream, low fat or soy) heated and frothed as required, to become a welcome cappuccino. Yeehaaaaa! Not quite conference coffee, but close enough! At morning break, the situation on the coffee machines was as streamlined as humanly possible; one person writing the name and order on the plastic lid, one person working the coffee grinder and filter basket, (or hot water for those who wanted tea) and another frothing the milk. Very impressive! However, not everyone was happy. I was eagerly waiting for my order when I became aware of a tense, some might even say terse, exchange between a barista and a conference attendee, an American woman who clearly wasn't happy with the beverage she had been given. "This isn't cawfee, I want regular cawfee." "Yes, that's what I've made you." "No it's not. I just want cawfee." The look of complete confusion on the barista's face would have been amusing in a different place. You could see her thinking "You asked for coffee, we made you coffee - how could that be wrong?" My attempt at explaining the differences in terminology, strength and taste were met with an icy chill - clearly the woman needed her kind of coffee NOW! The cogs in the American woman's brain were apparently struggling with lack of caffein. She began a few sentences, then finally spluttered: "I want American cawfee". A look of comprehension "Oh you mean a long black!" Oh deary me - this was not going well. The poor American couldn't bring herself to repeat the words, such is the power of cultural taboos and inappropriate language with its racist overtones. I'm not sure what she was visualising, but I doubt it was a cup of coffee. By now her husband had joined her and taken his cup of coffee - aka cappuccino - with a look of disgust. It appears that they hadn't realised that simply ordering a "coffee" will lead to confusion and that in the hurly burly of the noisy morning break, and without further clarification, that a cappuccino would be produced with a professional flourish. 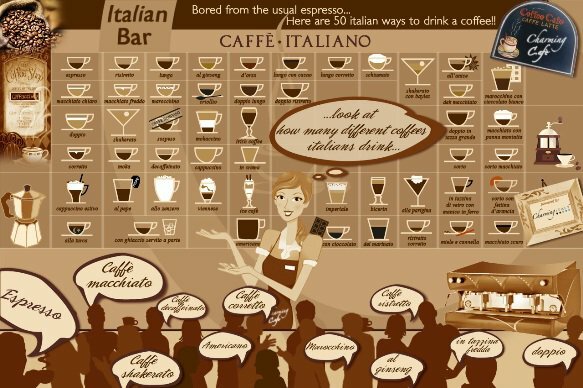 So, it goes both ways, it seems that on the subject of coffee, the differences in our expectations and tastes far outweigh the similarities and that many of us return home to our respective countries with tales of undrinkable coffee. My previous spluttering post about the American excuse for coffee is here. Well, I have to admit I had my first Cappuccino in Australia, and I loved it. Still do. Did she really say she wanted "American Coffee." Oh so many ways to give us Yanks bad names. But we aren't all bad...really! Hi Sue .. they don't sound grown up?! Crumbs .. and how very unpleasant .. I'm not that keen on coffee out and about, but a good cappuccino would definitely be a very delicious option ... they look really good. I'm a water girl through the day ..
Liza, when I was in Nevada at the training earlier in the year I had a ball with the local people, so I know you're as warm and welcoming as a visitor could desire! I loved the gentle, respectful 'poking fun' at each other and felt very welcome as I hope you did when you visited here. Hilary, I wonder if I managed to get the right tone and words. It was perplexing or confusing for the baristas rather than unpleasant I think. Water is by far the better option and too easily ignored for something expensive and probably unnecessary ... though very welcome! The conference was excellent, I learnt a huge amount and am using many of the ideas in my work already.